The amount they give you when you take away is crazy! There's so much more in these plastic containers than you would normally get if you ate at the hawker centre. 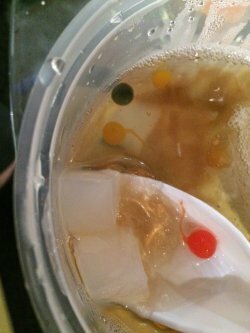 The iced jelly is served with maybe 20-30 nata de coco cubes and quite a number of tadpoles. It was a lot and I was so full from just the ingredients alone I could barely drink the dessert. It wasn't too sweet and its most probably because most of the ice had melted. 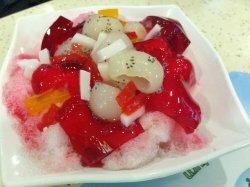 In this hot and sunny weather, enjoying a bowl of shaved-ice dessert is just so gratifying. This dessert house at Tiong Bahru Market is one of my favourites because it serves up a huge variety of hot and cold desserts in both traditional and innovative flavours so there’s always something for everyone. And the reason why I’d keep coming back to this stall is because the lady who takes orders is probably one of the most amiable hawkers I’ve ever met who is appreciative of every customer, every business regardless of how small or big each order is. It just makes patronising the stall a joyful experience each time. The soupsop itself is soury hence it’s soaked in a sugar syrup to make it more palatable. However the syrup is really sweet. So sweet that I felt sick of eating it after a while so I dug into the other half of the bowl that didn’t touch the syrup while the husband had all the soupsop since he loves sweet stuffs. 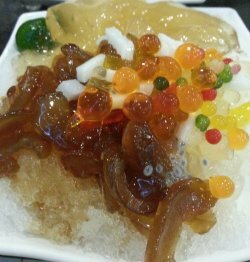 I like the different textures of the various ingredients especially the chewy nata de coco and the liquid-squirting ‘fish roe’ jelly. Very interesting combination. This is our all-time favourite. 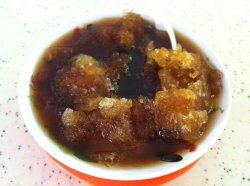 A standard ice kachang drizzled with a good quality chocolate sauce and topped with coarsely ground peanuts. What I love best about this is that the food colouring syrups do not taste artificial at all and in fact, blends well with the chocolatey and nutty flavours too. Of course, at the bottom, you’d get the usual ingredients of attap chee, red beans, etc. 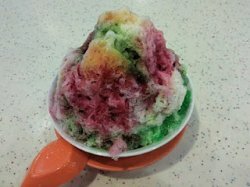 This is a really delightful ice kachang that is well concocted on the whole. Not too sweet, absolutely yummy. 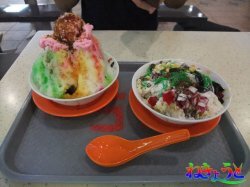 If you are looking for a cheap and good dessert place in Tiong Bahru after dinner, Tian Tian Yuan is a nice pitstop that you will definitely be able to find something that you like. They have more than 30 varieties of dessert that is available so you can go crazy choosing your favorite. I have been to this stall several times and I really love their cheng teng which is packed with ingredients. Their prices are definitely reasonable and they don't scrimp on their ingredients. Great service, great taste and great variety. What's not to like? Been a local living in a area pretty close to Tiong Bahru for the past 20+ years, One would definitely have dine at TIong Bahru market before. And frankly speaking, I still miss the old old Tiong Bahru wet market a lot. I remember that I have been eating the 'Chwee Kueh(水粿)' bought from Tiong Bahru Market ever since I was studying in the nearby kindergarten, having lunch at Tiong Bahru Market after my classes during my secondary school days and having my meals at Tiong Bahru Market during my weekends. Up till today, they are still providing cheap, delicious and big portions of desserts. And they are open to special request to customise your desserts. For example: I would place an order for Chendol or Ice Kacang with only Red Beans once in a short while. 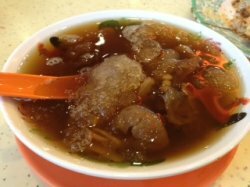 And frankly speaking, at a relatively low price of S$1.50 per bowl, you are getting a lot of ingredients and it tastes pretty good too. I ordered a bowl of Cold Cheng Tng. The Cheng Tng was not too sweet but was just nice for my taste buds. 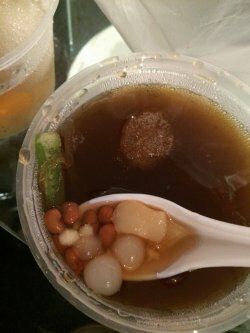 Inside have generous serving of ingredients like green beans, red beans, barley, persimmon, longan meat and ginko nut and waterchestnut to the dessert hence giving it a crunchy texture with every mouthful. 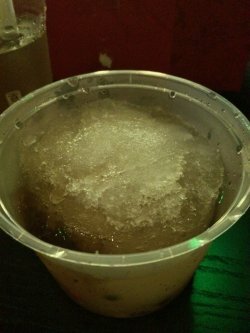 The Cheng Tng is simply refreshing especially on a hot sunny day. I will definitely come back again to try other desserts and highly recommended to try this! 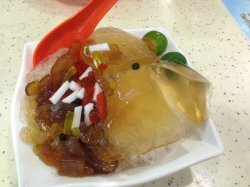 I had the sea coconut with ice jelly ice as the weather is hot and humid, all one need is a really icy cold dessert to cool down. This is my favorite stall of all and the stall owner never fail to cheer me up with their friendliness and fast speed to prepare the dessert. The taste of the dessert is sweet yet not overwhelming sweet. 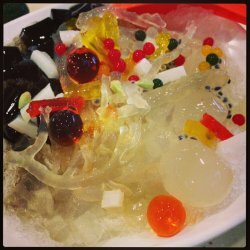 The sea coconut is crunchy and the ice jelly simply melts in your mouth. I love to squeeze dry the lime given to give this dessert an extra sour punch! 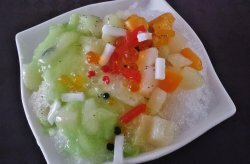 The FoodI ordered a bowl of cold honeydew sago topped with generous portion of honeydew chunks, tadpole jelly and fresh thick coconut milk. 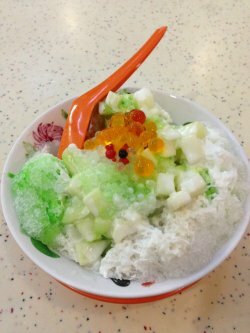 The honeydew chunks are sweet hence there is no need to put the coloured syrup. The tadpole jelly also have a crunchy texture and overall very refreshing especially after a nice meal.The PriceReasonably priced at $1.50 hence value for money.OverallI will definitely come back again to try other types of dessert and highly recommended to try this! This stall was featured as one of the oldest stalls in Tiong Bahru Market and I got curious about it so I went to check it out last weekend. 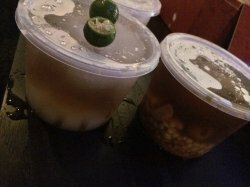 Ordered the chinchow with lychee and mixed sago. The portion given was really big! and it wasn't expensive at all. One of the best traditional kind of ice dessert I've ever had. The ingredients are really fresh, and doesn't seems to be soaked inside those sugar syrup to make it sweet. Everything tasted original. The auntie is very friendly also. thumbs up! After a round of the savory main meal it was time for dessert. The weather was terribly hot and the only desire was to quench the heat with icy cold stuff. This stall has many varieties and most of them are interesting and really nice and creative. I ordered the tradition ching teng with dried pessimon, green beans and barley etc. All these made the ching ting very 'rich' in taste and nice. 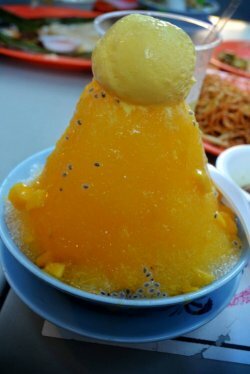 the mango ice from tian tian yuan eating houseordered this mango ice as i always love mango dessert but this is kinda disappointing though. the ice is so course that i need to chew it a bit, i would like the ice to melt just after it is in my mouth. the mango syrup is not fragrasnt, there is no mango flavour and not so sweet too. the mango ice cream on top is creamy and not bad and the overall presentation is nice too. ordered this mango ice as i always love mango dessert but this is kinda disappointing though. the ice is so course that i need to chew it a bit, i would like the ice to melt just after it is in my mouth. the mango syrup is not fragrasnt, there is no mango flavour and not so sweet too. the mango ice cream on top is creamy and not bad and the overall presentation is nice too. We ended our meal with an ice kachang from tian tian yuan dessert stall. 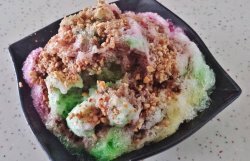 The ice kachang was really cheap less than $1.50. there was one pile of ice and different colour syrup. Normally the syrup makes the ice kachang really very sweet when the ice melts but I guess they added the right amount of syrup so when the ice melted, it was not too sweet. They added a fair amount of evaporated milk which gave the dessert a creamy and milky taste. The ingredients inside were a reasonable amount for the price we are paying. We found two atap seeds, red beans, jellies and corn. It was very refreshing especially when eaten on a hot weather. 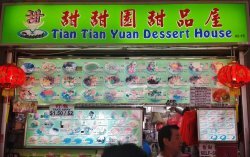 Dessert @ Tiong Bahru Market's Tian Tian Yuan Dessert House - A place with full of affordable and hearty dessert! as we all know, Tiong bahru market is one of the famous market with lots of "treasure" here.. there are more than 30 or 40 food store here, and some of the food store kind of repeated. 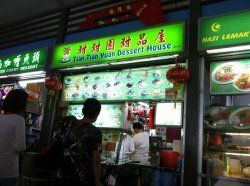 Everyone have their own preferred store... so i happened to like this Tian Tian Yuan Dessert House. saw many ppl trying out desserts in green bowl... therefore i went around to look for which store is using the same green bowl.. I had the Qing Teng (One of the best Qing Teng I must say, Red and Green bean was added into the dessert thus it is very sweet, and it is very unique to know they have red and green beans in it, the normal or perhaps the Standard ones from other store doesn't), less than $1 i think... forget the price.. I didn't realise I have ordered from this stall until I saw my previous review. The last time here, I felt that the ice kachang was too overly drenched with sweet syrup. This time, the syrup amount is just right without being overly sweet. 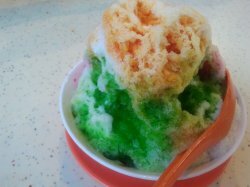 I also like the addition of evaporated milk to the ice kachang since it give it some milky sweet taste. 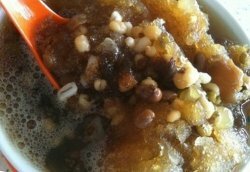 The ingredients for the ice kachang are the usuals - red bean, cubed jelly, corn, atap chee etc. I like the atap chee best since it happened to be more hard this time around, and I preferred my atap chee to be firmer since there is more texture. Overall, my impression of this stall has improved from my previous visit. 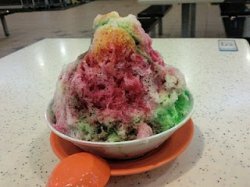 This is a memorable dining moment for me because.....sharing Ice kachang with my husband is the best thing ever. 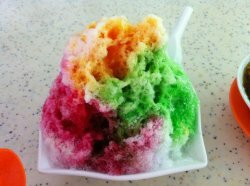 We happened to go to Tiong Bahru market one evening & tried out the Ice kachang. First of all it looks so tempting & colourful. Besides, I love the taste as well-- with a combination of various flavours. It costed about 1.3 $. Ice Kachang a perfect dessert for a hot sunny day. I simply love it. This dessert stall attracts the most crowd as compared to other dessert stalls from where I was sitting. 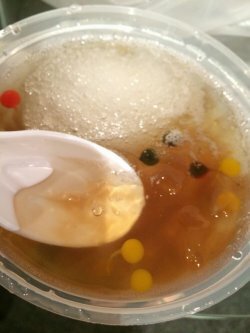 They offer a variety of desserts like honeydew sago, cheng teng, red bean soup etc and some desserts with very innovative names. I decided to go for their normal ice kachang which costs $1.20. I think such a price is practically non-existant now given most dessert stalls sell their ice kachangs for at least $1.50. 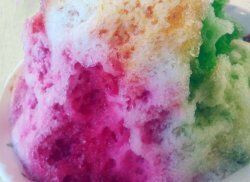 It is actually too sweet for my liking as the stall owner seemed to have been too overly generous with the sweet syrup as seen from the picture - the ice kachang is such an intense colour. 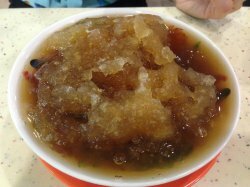 The ingredients are very little as well - standard 2 atap chees, but the red bean, jellies and corn are very minimal, and they used the chendol green jelly which is hard and not soft like it is supposed to be. I know it is only $1.20, but I think the ingredients are really far too little - I rather they increase price and give a better serving. Overall, thumbs down.